CUT, TRULY A CUT ABOVE THE REST! It is that time of year when tertiary institutions welcome back their students and open their doors for the next academic year. In line with being an innovative institution and setting the pace for other universities; CUT’s opening took the form of a ‘State-of-the-University’ address. Earlier in January students were encouraged to let Prof. Thandwa Mthembu, CUT Vice- Chancellor and Principal, know via social networking sites Facebook and Twitter what they wished him to focus on during his address. The concept of a State-of-the-University Address is a CUT innovation, which was first started in 2012, and serves as an important platform to give an account to all CUT stakeholders on the university’s progress over the last year and affirm the institute’s vision for 2013 and beyond, including the strategic mobilisation programme as informed by , Vision 2020. The address was presented by Mthembu who recommitted CUT to provide quality first-rate education that nurtures the various tangible and intangible talents, imparts high level skills and enhances the intellectual capabilities of our young people. 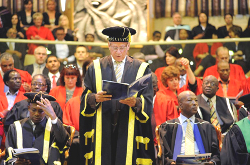 The address also focused on demonstrating the university’s commitment to the social and technological innovations for the socio-economic development of the central region of South Africa. “Today is not just about opening the university, but a demonstration of public accountability to our students, their families, our staff, our stakeholders and partners,” continued Prof. Mthembu. Only 17% of youngsters between the ages of 18 and 24 constitute all university students in South Africa. “The future of knowledge generation, innovation and wealth creation in this country is the shoulders of these young people; and beyond that, university of technology students, only make up about 3% of this 17%; making CUT students truly unique and part of the new generation university for the 21st century that focuses on innovation and high level skills for the workplace. “CUT is committed to supporting our students’ educational endeavours. We see our role as a partnership with our students; we are well-equipped and poised to provide students with tools and an enabling environment in which they can flourish and achieve their own intellectual vision and career path. In return as part of the partnership, we require that the students also play their part by being determined, self-disciplined and diligent; and that they are hard and smart workers ready to master the subject matter of choice on which their future career will depend. “We listen to the needs of our students and take to heart the recommendations and suggestions that they have. Over the past three years, approximately R 250 million has been invested in various key facilities for students through generous contributions from the Department of Higher Education and Training (DHET) and CUT Council towards this investment. “Our greatness and our idyllic place as this ISLE OF INNOVATION lies in our students’ discovery of knowledge and pursuit of truth through quality education, research and innovation, deep engagement with society, and value-adding strategic partnerships. “We have anchored our vision in achieving this greatness – and look forward to walking the path with you and transforming our university, our region and our country to greater heights in the process, and endeavour to continue being a CUT above the rest ” concluded Prof. Mthembu.